Dubai, UAE: While the number of businesses investing in IoT across all markets continues to grow, recent research shows that 60 percent of IoT initiatives stall at the proof-of-concept (POC) stage. 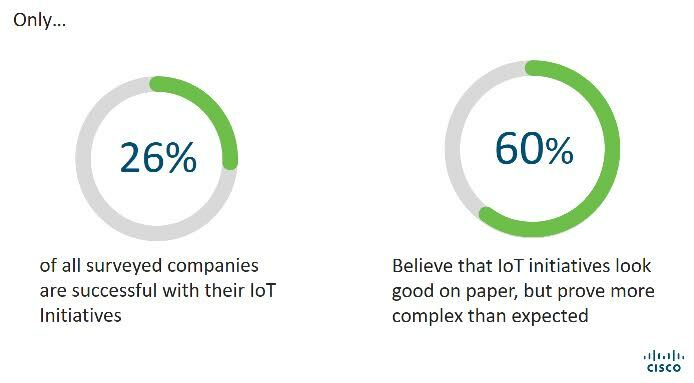 This highlights that companies today are still struggling with the key challenges of IoT, including the need for more flexibility, greater security, and the ability to address new use cases. Cisco® Jasper® has been partnering with service providers to help its customer base, which has grown from 3,500 to 11,000 enterprises in the past year alone, to overcome these challenges and accelerate their IoT success. To continue to meet the exponential demand for IoT solutions, and in keeping with Cisco’s dedication to helping customers get from paper to successful IoT deployment more quickly, today Cisco Jasper introduced a new expanded model to bring the benefits of its IoT connectivity platform – Control Center – to a broader audience. Control Center 7.0 addresses business’ needs for greater flexibility with a new multi-tiered IoT platform that gives companies various options to meet their specific needs, regardless of which stage of IoT implementation they are in. This new platform is also paired with a new set of Premium Services that address previously unmet needs in the industry related to IoT monetization and security. Advanced Capabilities: A new tier of the platform – Control Center Advanced – caters to customers with more sophisticated deployments that need greater capabilities. Premium Services: The introduction of our first two Premium Services, compatible with Control Center, enables customers to solve for previously unmet IoT business needs. The Threat Protection & Smart Security (TPSS) service provides an IoT-specific solution to protect against malware and phishing attacks, and is built on Cisco Umbrella. The first applications of TPSS will be in the Connected Car industry. The second service, Traffic Segmentation, provides a new solution to support different types of revenue generation models. Cisco Jasper service providers can customize Premium Services to meet their customers’ specific needs. AT&T, a Cisco Jasper service provider partner, is integrating these additional capabilities to meet IoT needs for a broad range of industries. The platform will be called AT&T Control Center Advanced, and will be paired with AT&T Premium Services. Collaboration: Integration with Cisco Spark™ gives users the ability to easily collaborate on issues with connected devices, enabling them to lower resolution time and manage costs.